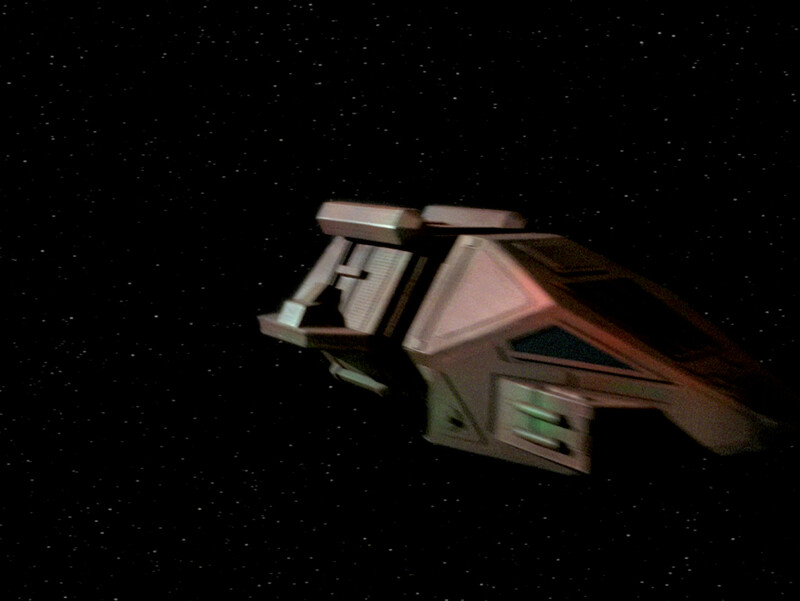 This article investigates the model history of the shuttle Nenebek from TNG: "Final Mission". 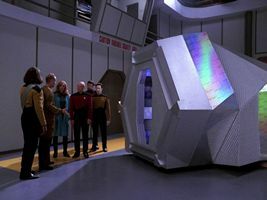 The title of this article is not totally accurate, since parts of the full-scale mock-up of the Nenebek were seen in three earlier episodes. Yet, the Nenebek is the arguably best known and also the most elaborate variation. 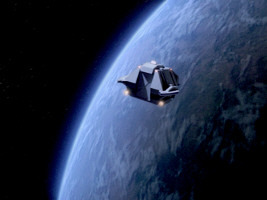 "Final Mission" is also the first episode that shows a corresponding miniature of the shuttle. 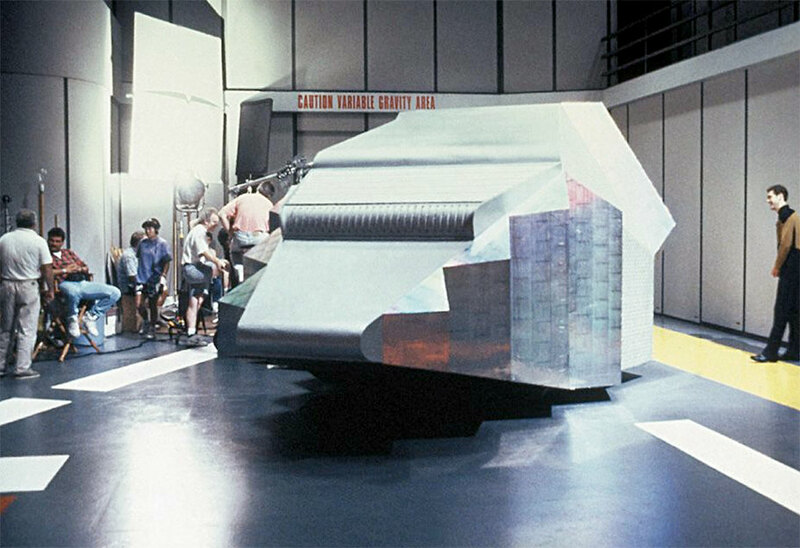 As already mentioned, the full-scale mock-up of the shuttle existed before a model for the Nenebek was created for TNG: "Final Mission". This mock-up could be seen in "The Most Toys", "Transfigurations" and "Legacy". For these three episodes it was not necessary to show the ship in open space, so the mock-up was sufficient. The interior was not really visible in these three episodes either. Only in "The Most Toys" we could see Data inside the shuttle through the cockpit window. This situation changed with "Final Mission", as the Nenebek was going to appear in space. The interior was fully outfitted for this episode as well. 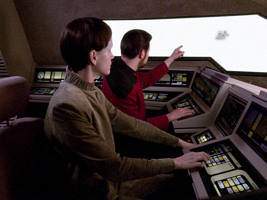 The evolution of the cockpit set, the interior of the mock-up, is described in the separate article Redresses of TNG's Alien Shuttle Cockpit. 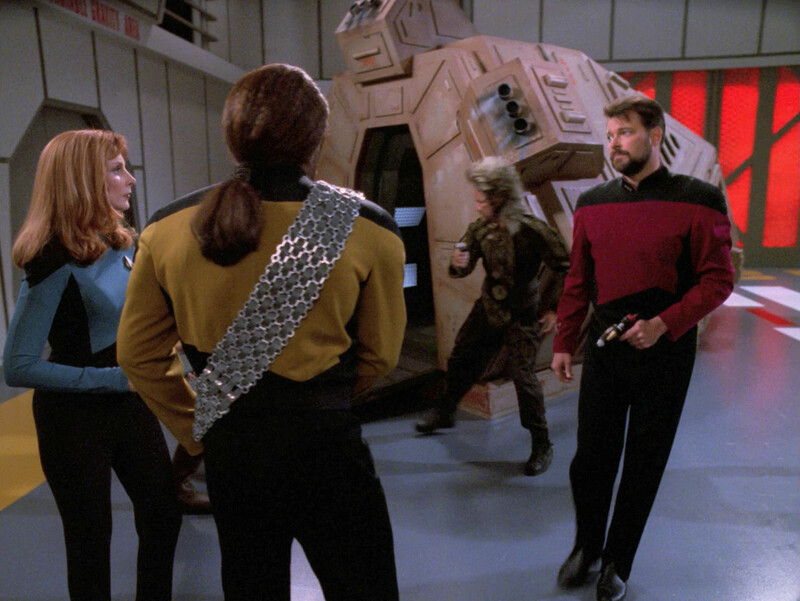 It has a history that predates the exterior and dates back to TNG: "The Price". 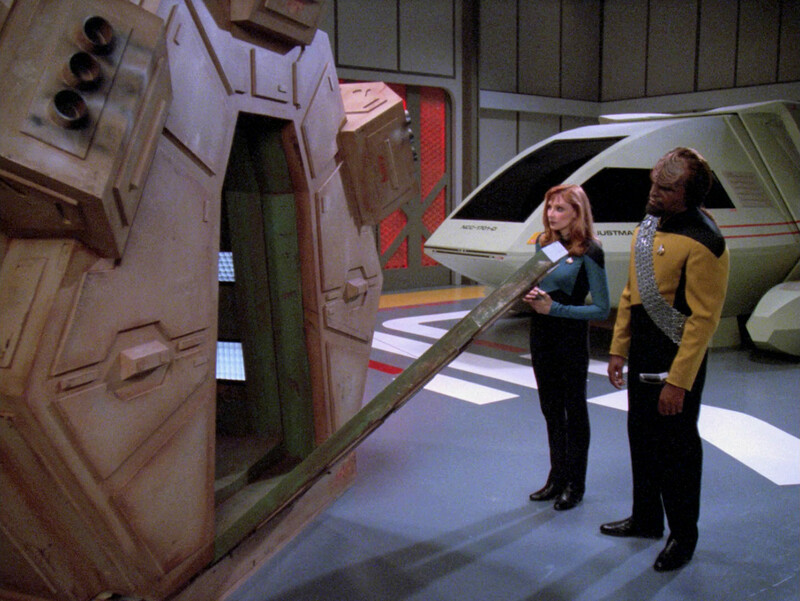 The shuttle exterior can be seen for the very first time aboard Kivas Fajo's ship Jovis in TNG: "The Most Toys". 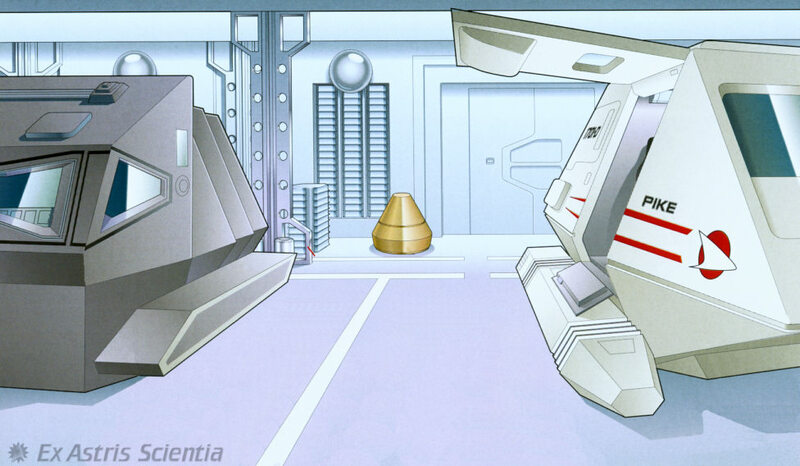 At one point Varria identifies it as an "escape pod", another time as a "shuttlepod". 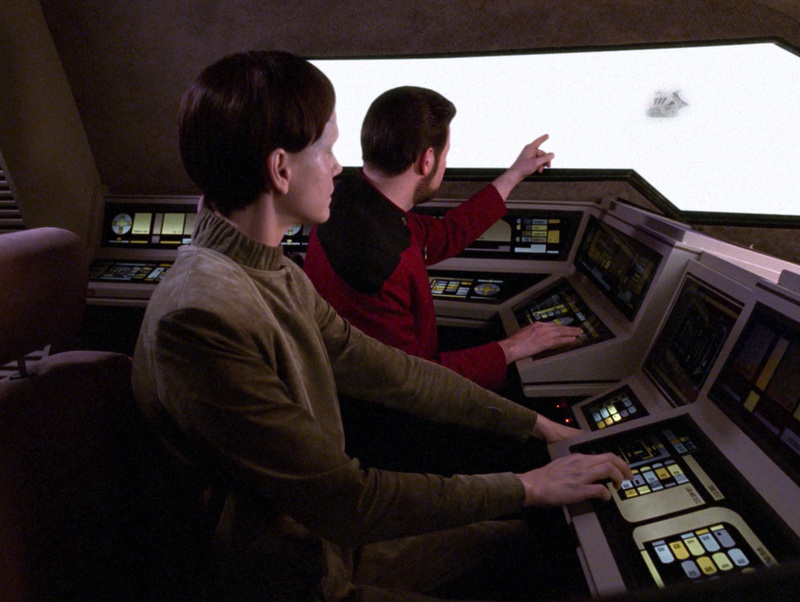 We believe that the interior set of the shuttle, which we can see through the window when Data is inside the shuttle, existed prior to this episode and was extended to an exterior set. 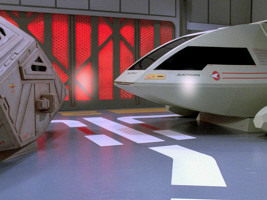 Zibalian shuttle mock-up in TNG: "The Most Toys"
A drawing of the Jovis shuttlebay together with the shuttle was created for the Star Trek Fact Files. The illustration reproduces the look of the shuttle overall correctly. The aft portion of the shuttle features a round docking ring on a hexagonal main body and looks much like a hexagon screw that was cut down. Looking closer, the "screw head" consists of three concentric hexagonal parts that grow in size forward. The round part is flattened only on the bottom. It holds an octagonal hatch with X-shaped struts. The hatch opens inward, with hinges on the starboard side. This whole portion of the model will remain essentially the same in the following appearances in "Transfigurations" and "Legacy". 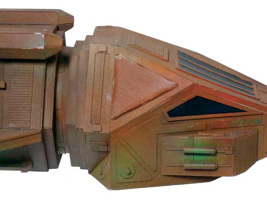 The forward part, on the other hand, still looks very different in "The Most Toys". There is no tapered front tip yet. The forward wall is perpendicular to the floor. Only the side walls and the roof of the cockpit are slightly sloped. Therefore the Zibalian shuttle looks overall much more boxy than the later versions. 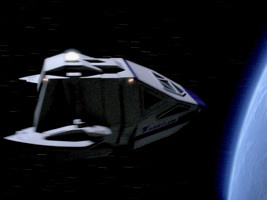 It is easy to understand why it is referred to as "escape pod" or as "shuttlepod". The big windshield is pentagonal (it has an indentation on the top center). The lateral windows are pentagonal as well. 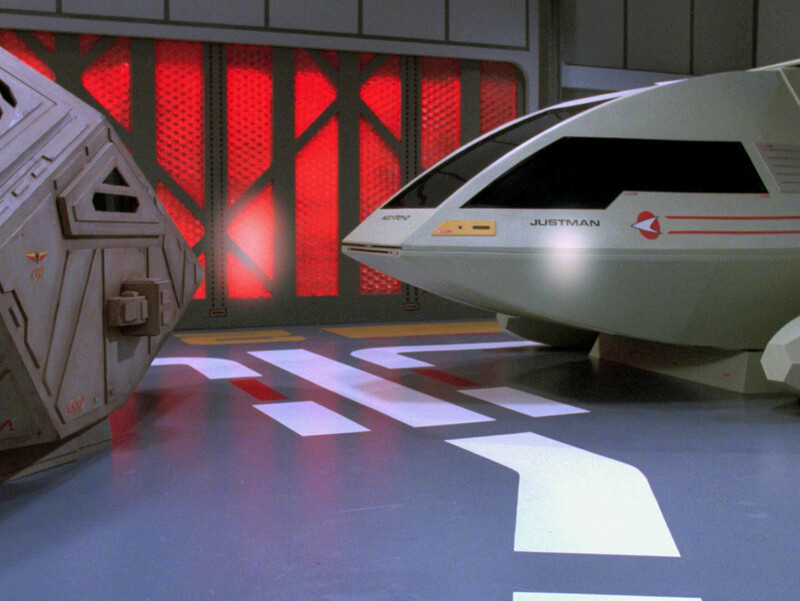 We can only speculate about the exact size and shape of the two nacelles of the shuttlepod. They are almost as long as the shuttle's main hull and are tapered towards their aft ends, with the ventral surface sloping up. 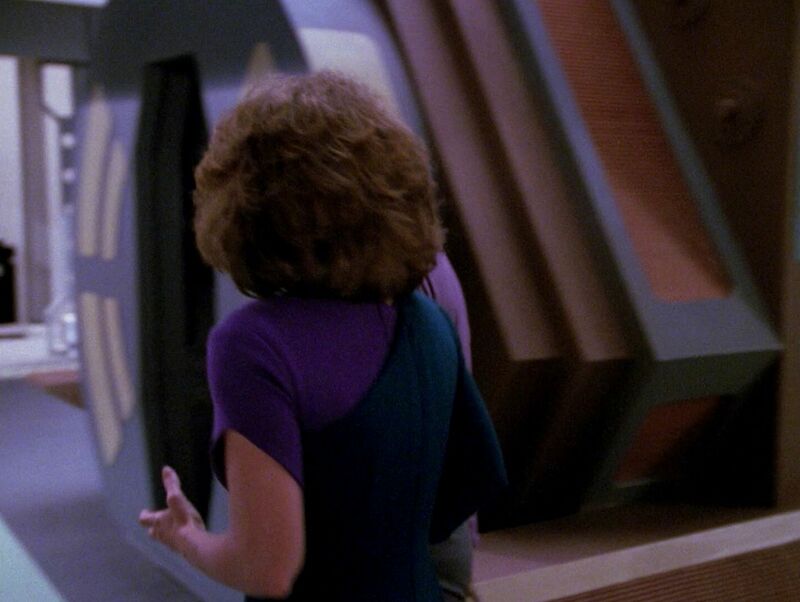 In forward direction, the dorsal surface slopes down, so overall the nacelles are parallelograms in the side profile. Their aft profile is hexagonal. 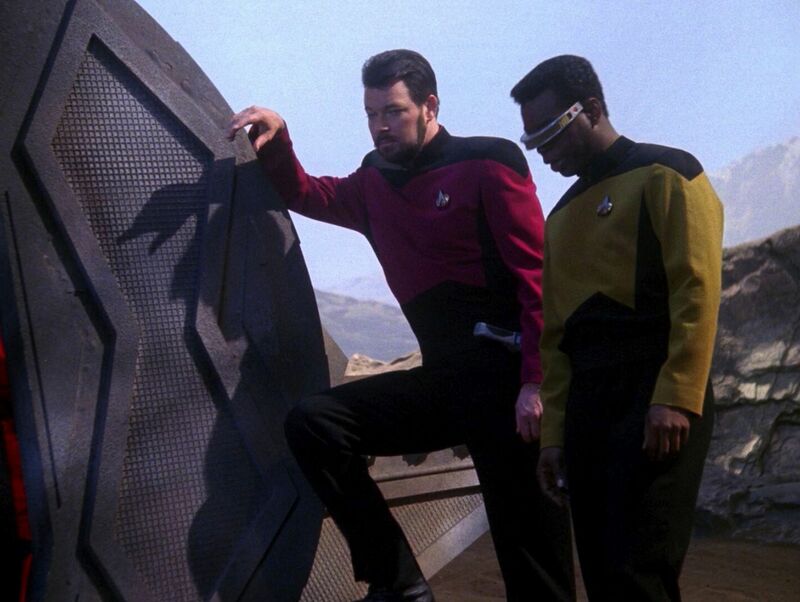 The nacelles seem to have some sort of inlay consisting of a copper material in a beige frame that has the same color as the main hull of the shuttle. For this appearance, the life-size mock-up was modified in a fashion that makes the later Nenebek already recognizable. 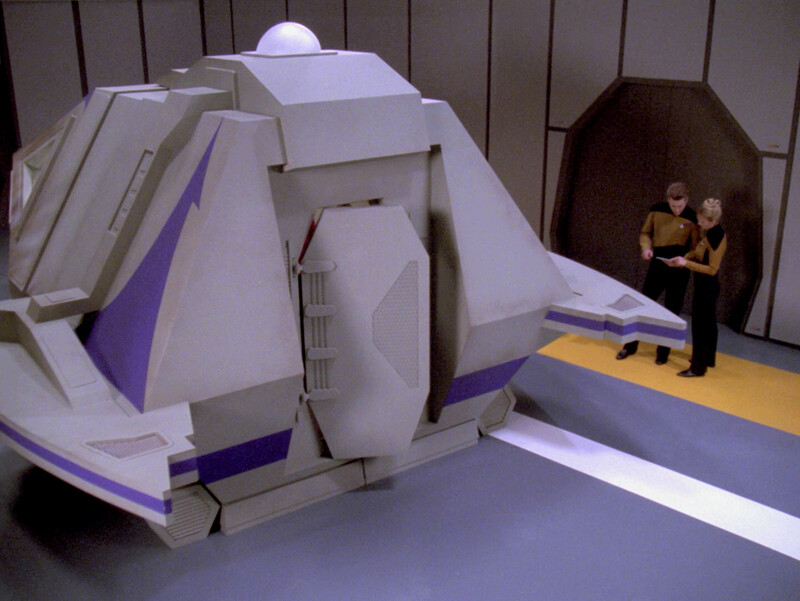 The aft section remains almost unchanged compared to the Zibalian shuttlepod. Everything is colored more monochrome, the four aftmost concentric shapes are all gray. On the aft ring we can still recognize the outlines of the former yellow rectangles. Only the region of the foremost hexagonal concentric shape of the aft section was modified. Boxes were added to the top and to the sides. The upper lateral hull panels are no longer painted in copper but gray, looking somewhat darker than the rest of the surface. A vertical strut was added, separating the panel in a left and a right half. 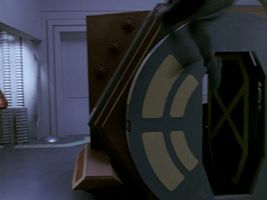 Zalkonian escape pod mock-up in TNG: "Transfigurations"
The aft wall still holds the octagonal door. The hinge is still on the starboard side. A few odd-angled strut-like elements were added to the surface around the door, covering about the same area that was painted yellowish on the Zibalian shuttle. 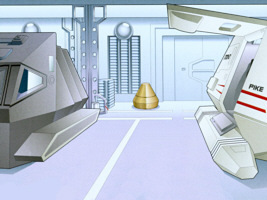 The complete forward section was renewed and now already largely corresponds with what it will look like in "The Final Mission". 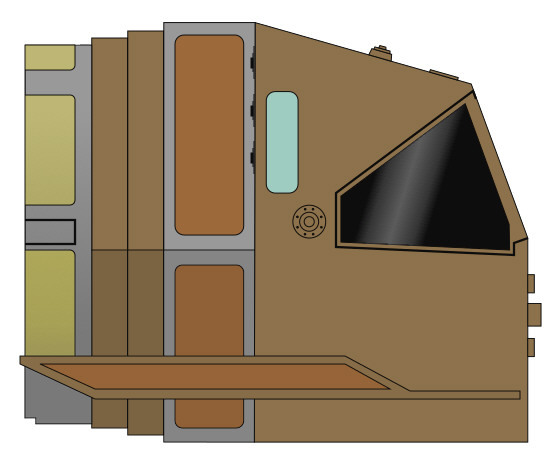 There are four-sided lateral windows like on the later Nenebek (and broken at least on the port side). Behind and above the window we can see a triangular hull segment. Although it looks similar from the outside as the segment with the window, we assume that no window is placed here (yet), as we can't look inside through the ruptured hull. There appears to be a forward window too, but we can't recognize its size and shape. Another important modification is the addition of wings on either side of the mock-up. These wings run along almost the whole length of the shuttle. As the forward end is buried in sand, we can't recognize how the wings look in this area though. The upper surface of the wings is located directly at the centerline of the shuttle, where the two lateral edges of the hexagon meet. On the port side, the wing is ripped open, some kind of drive coils has fallen out and lies beside the shuttle. The aft cover of the wing was apparently damaged too; at least the port wing is slightly shorter than the starboard counterpart and does not have an aft cover. 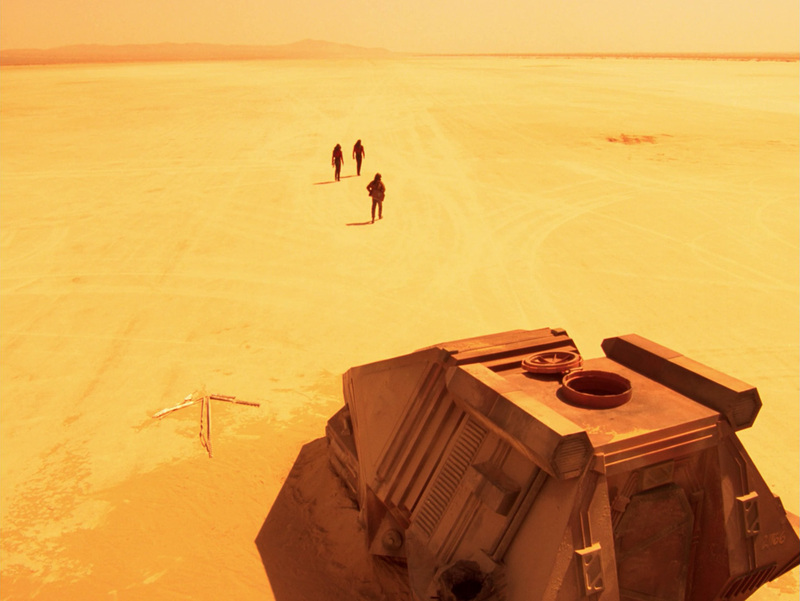 A slender, three-meter-long, heavily-damaged escape pod is in the center of the area. However, we can see no damage to the mock-up (as opposed to the Zalkonian escape pod in "Transfigurations"). 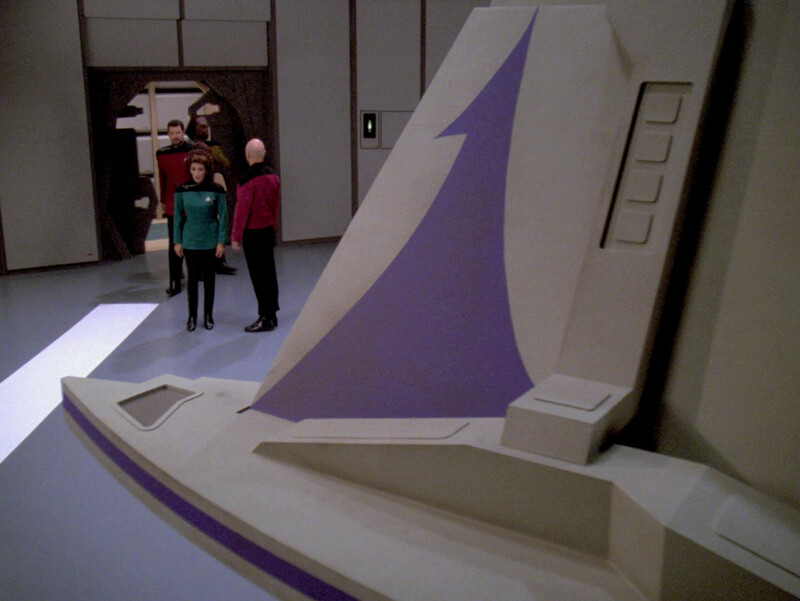 Arcos escape pod mock-up in TNG: "Legacy"
The Arcos escape pod looks like the Nenebek in many regards. 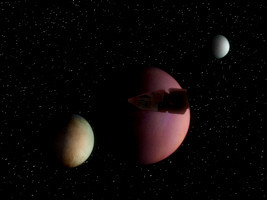 The lateral window corresponds with the one of the Zalkonian escape pod and the later Nenebek. The windshield is triangular here and will be different in its next appearance. All windows are bright white per illumination for some reason. We can't look inside. The boxes below the lateral windows near the front tip were added and look like on the Nenebek. 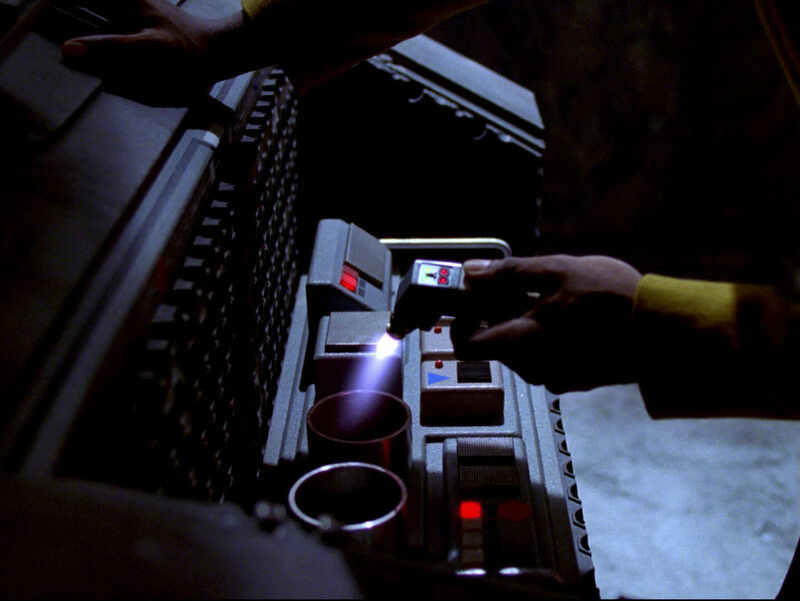 We don't see the elaborate details on the panels with the thrusters yet. But we assume that the lateral details are already like on the Nenebek too. Furthermore, four identical structures were added to front side: three above and one below the windshield. We can see how Geordi uses the lower structure like a handle to open the "engine hood" of the Arcos escape pod, which exposes some circuitry. 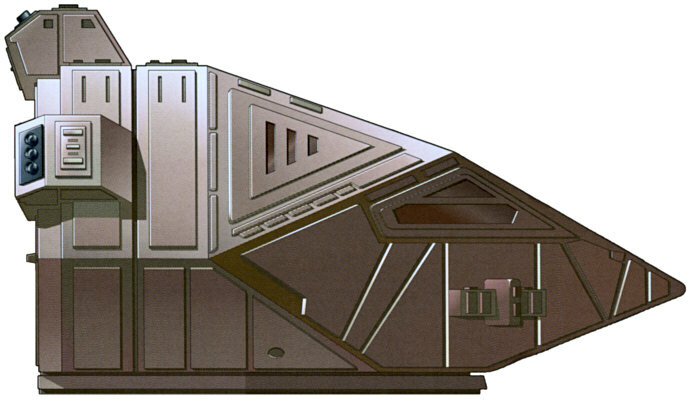 The hull color is still gray, like on the Zalkonian version. 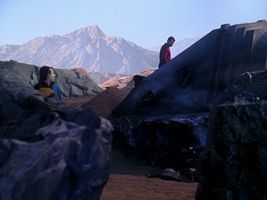 GEORDI emerges from the miners' shuttle -- a small, ragged vessel that looks like the space equivalent of 'The African Queen'. 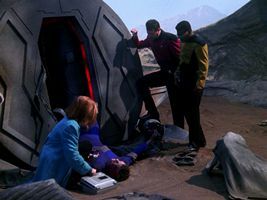 Dirgo (jerking his head toward the cabin): "If your Captain isn't tougher than he looks, those miners will tear him apart." Wesley: "Don't worry about Captain Picard -- he'll handle them." So Dirgo was supposed to have a word with Wesley about Picard, without Picard noticing that. The shuttle is in chaos. 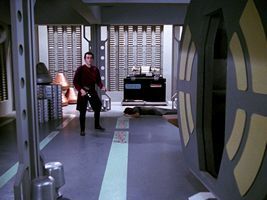 Dirgo wrestles with the controls as the ship continues to shudder violently. 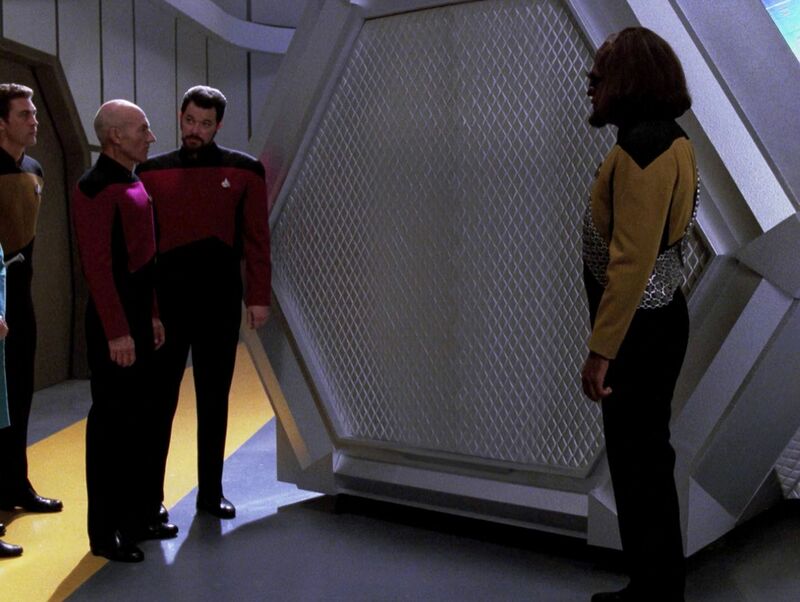 Picard bursts through the door of the cabin. 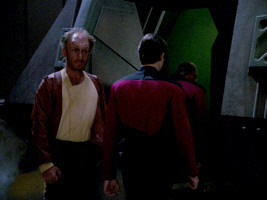 Now Picard leaves the aft compartment and steps into the cockpit part. "I can't say that I *designed* the Nenebek, because I built the model from the set designers' blueprints. I might have suggested a few plant-on parts, but my real memory of the ship was measuring off the blueprints and constructing the model from a variety of art boards and plastic greeblies. 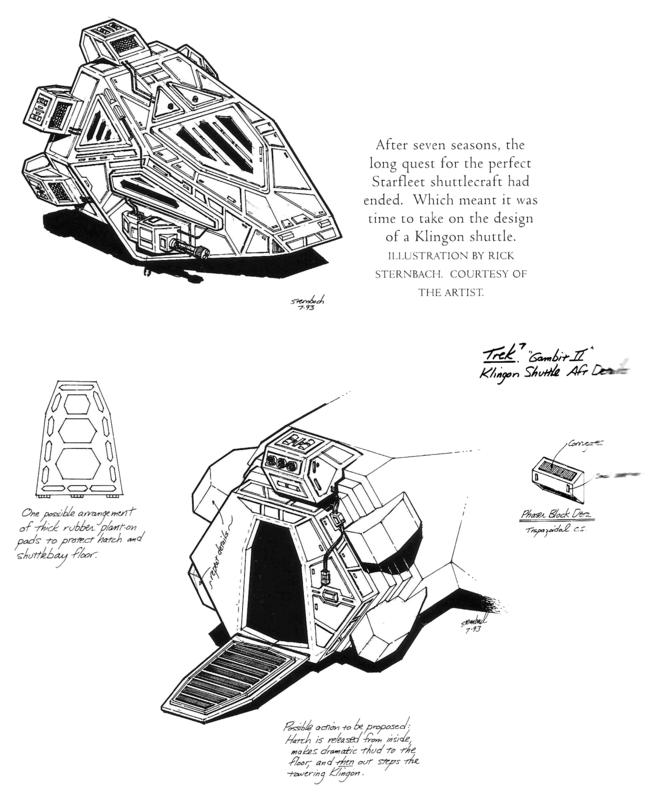 I don't have any sketches of the ship that I can locate. So, call it an art department team effort. 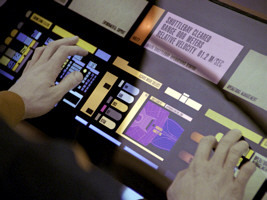 :)"
Only in HD, in the shots showing the shuttle aboard the Enterprise, we can recognize the true colors of the Nenebek. 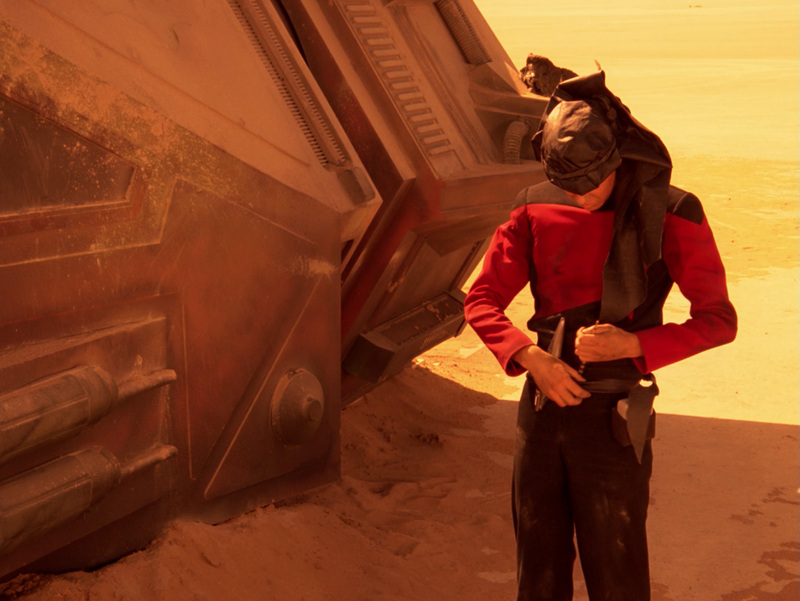 The forward portion is red (and quite dirty), while the mostly new aft section is brown. In both portions there are some gray elements. 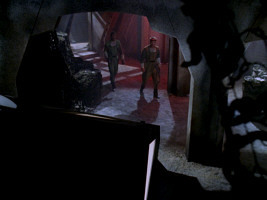 Nenebek mock-up in TNG: "Final Mission"
The triangular area above the lateral window is labeled "Nenebek". 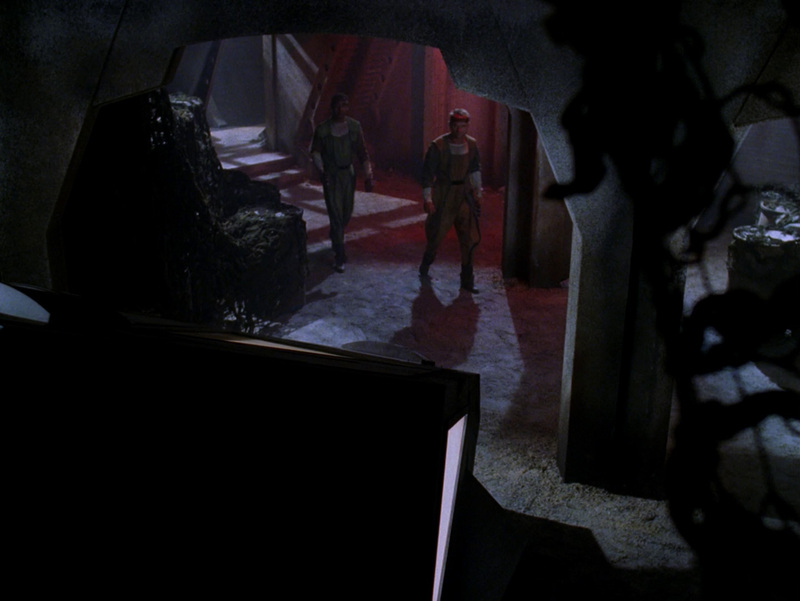 We can't see this so well on the still, but in the moving image it is clearly legible. "Jeri [Taylor] did tell me at one point that coming up with alien names was part of the job she hated the most, and would do that--change single letters of another word to the adjacent letters, as a quick workaround. As she did here. [...] At the time she named it she did not know me except as that name on those 3/8-inch cardstock [of Nemecek's Concordance fanzine]." 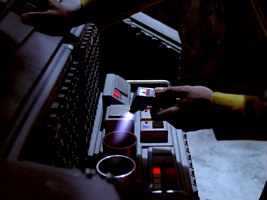 We can also read the registry NAR-21166 on the mock-up, just as on the miniature of the shuttle. 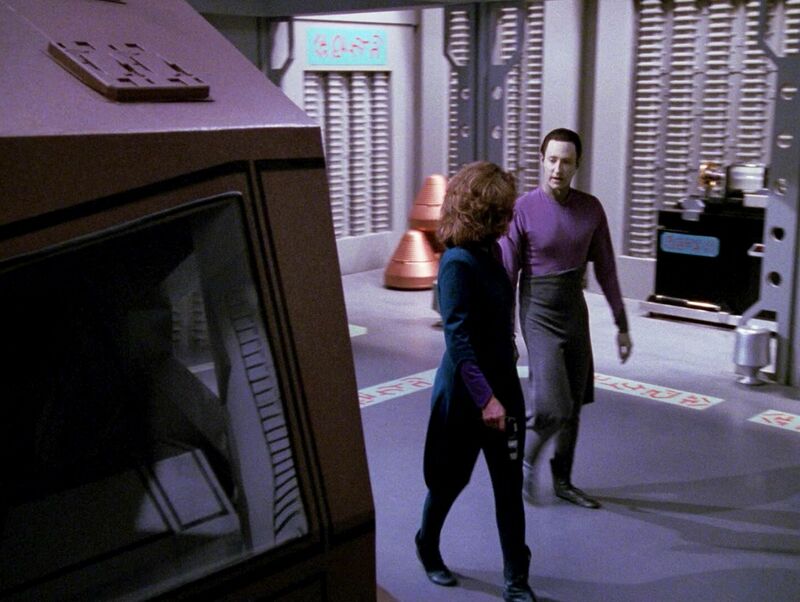 On a side note, in the remastered version the registry NAR-21166 also shows up on a display on the Enterprise-D.
Nenebek registry on Enterprise-D display in TNG-R: Final Mission"
"NAR was usually a tip o' the hat to the National Association of Rocketry, to which Mike [Okuda] and I belonged (I was in the NAR from 1965-1971, Mike probably somewhat later). " "It's the number for an old friend. My number was 18834, which I used somewhere else." 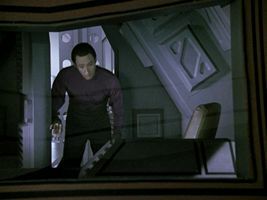 The front window of the cockpit is no longer triangular as on the Arcos escape pod but a trapezoid, with two vertical struts. On the side of the new aft section we can see the only part of the Nenebek that is illuminated. It is a box with four green blinking bars forming an "X". 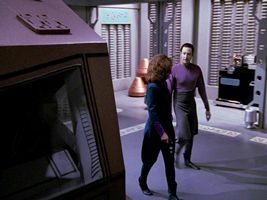 "I'm guessing the hex tubes were some sort of engines." The former aft door of the cockpit, now inside the shuttle, is still octagonal, but the hinge is now on the port side. The new door of the aft section is octagonal too and has its hinge on the port side. On the port side, near the aft end of Nenebek, we can see the number "21166". 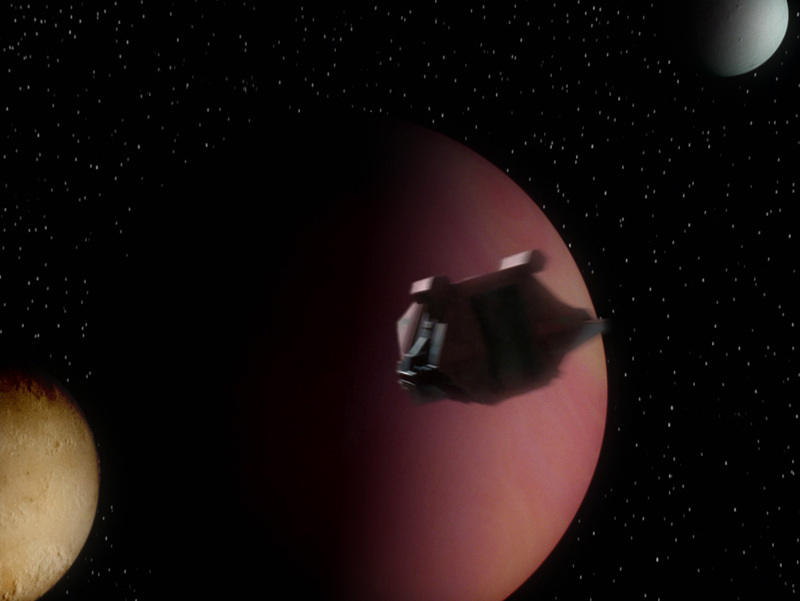 Owing to the bright sunlight on the planet surface we can't recognize the true hull color even in HD. But we can see some details of the ship better. 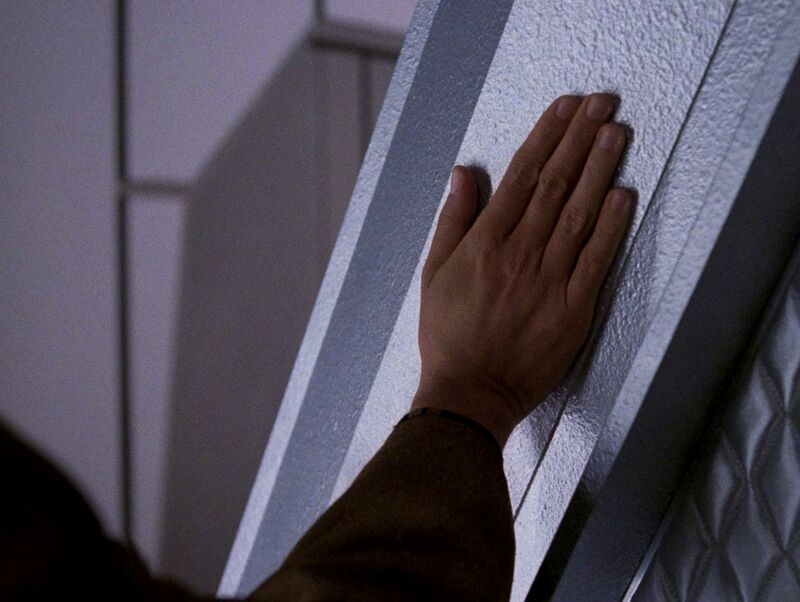 The two half-tubes in the same panel as the lateral thrusters are the same props as the transporter test cylinders or sample containers, known in real life as sonobuoy casings. Regarding the miniature of the Nenebek, it was needed because the shuttle can be seen in space too. This miniature was on an auction a couple of years ago. It still looks like it appeared in "Final Mission" (and in "Birthright I"), including the registry NAR-21166 underneath the lateral starboard window. So we may conclude it was not modified after its appearance. The miniature reproduces the look of the big model with a good level of detail. Most likely it was built after the mock-up was completed. Yet, there are some minor discrepancies. It is a simple model without lighting and so the green "X" on the lateral box near the aft end remains dark in space. Also, the flexible tubes on either side of the box are missing on the small model. We may be able to neglect some more inconsistencies, such as the uniformly brown color of the miniature. 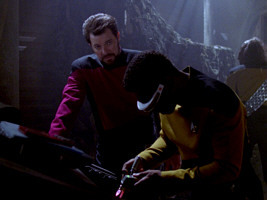 Nenebek miniature in TNG: "Final Mission"
"Well, I built -a- Nenebek model. It was supposed to be an art department study thing for VFX, but they apparently just dirtied it up and filmed it. [...] [It took] three or so days maybe. It went pretty quickly, copying shapes, cutting and scoring and bending the pieces of board and holding it all together with hot glue and superglue." 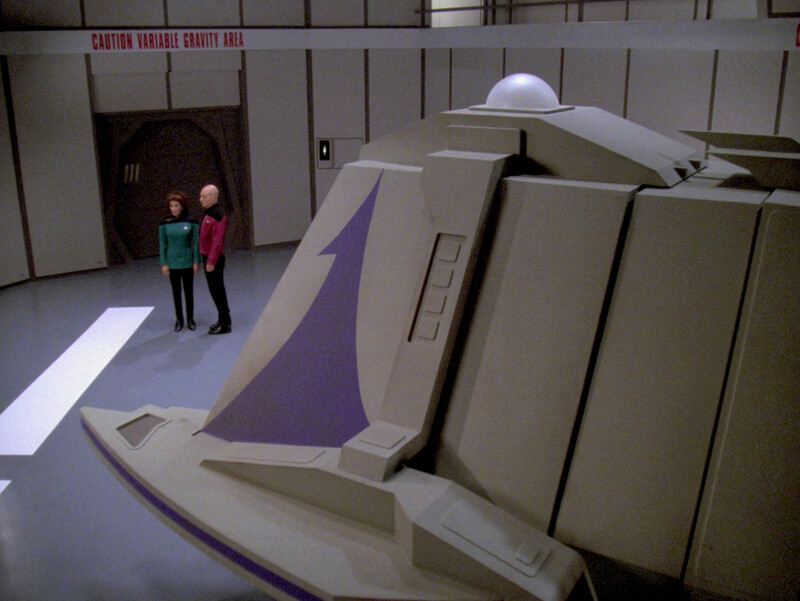 For this episode the life-size mock-up was modified extensively, from the inside as well as from the outside. In particular the changes to the interior set were retained for later reuses. A view of a tiny multifaceted spacecraft appears. 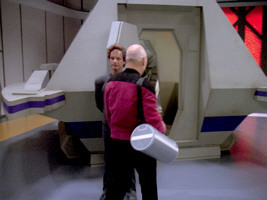 The first time we see Rasmussen's time pod in "A Matter of Time" is on the Enterprise-D main viewer. 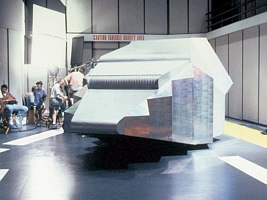 Later, in the shuttlebay, the mock-up is only visible from behind in all scenes. 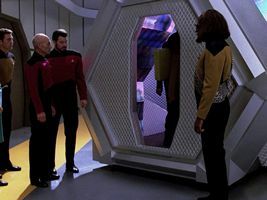 Time pod on the screen in TNG: "A Matter of Time"
Comparing the first appearance on the viewscreen with behind-the-scenes photos of the mock-up showing a front view, we can see that in fact the life-size mock-up was used for the shot in space as well. No small-scale model appears in the episode. The pod hardly moves across the screen, so no complicated motion control photography was required, of the kind that would only have been possible with a small model. 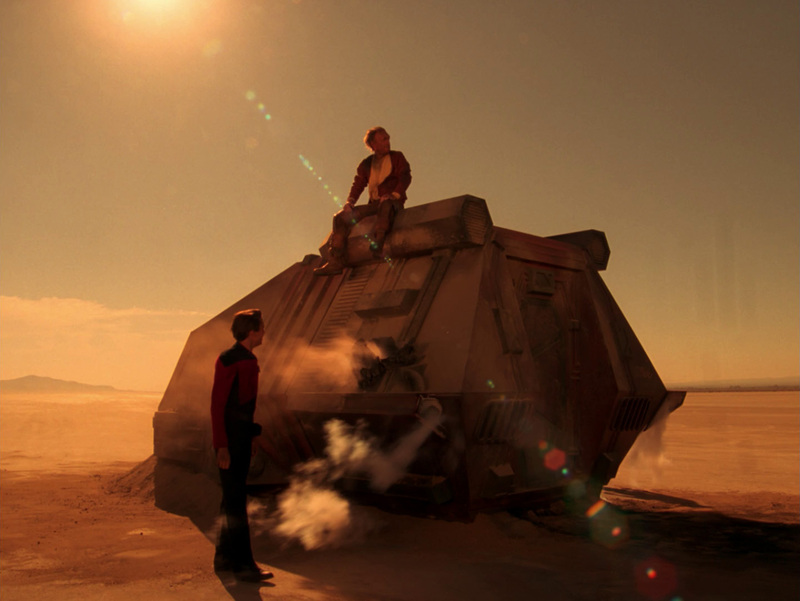 So most likely the mock-up was simply inserted into the space background as a photography. Time pod mock-up in TNG: "A Matter of Time"
As we can see, the whole surface of the time pod is covered in silver metal plates. Even the windows are completely covered from the outside. The whole aft section added for the Nenebek was removed again. 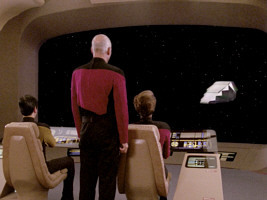 So we are only looking at the original cockpit set/mock-up. The octagonal cockpit door is still the same. Due to the additional hull plates, the aft section does not consist of concentric rings any longer but has an overall tapered hexagonal profile. 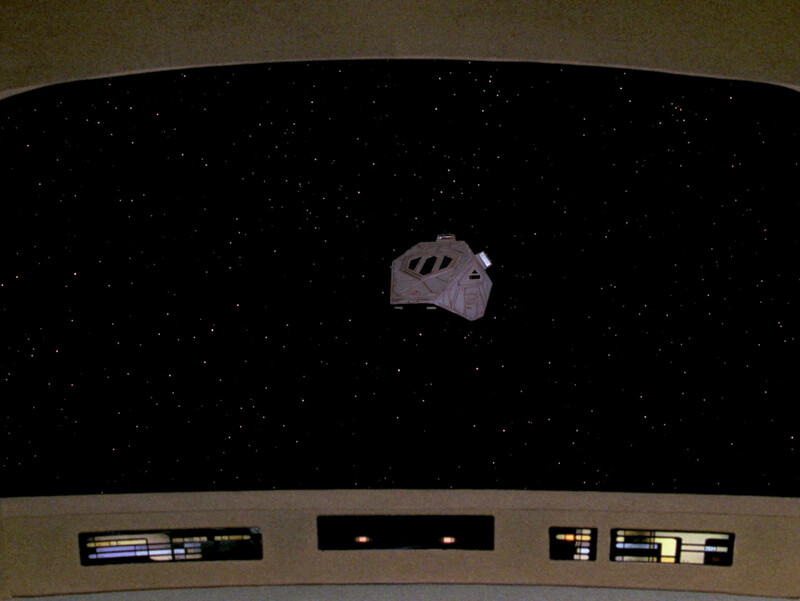 This episode shows the shuttle only in one single shot in space. 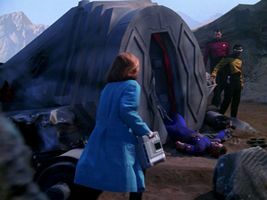 The miniature was used for this purpose, as the life-size model had been converted to the time capsule in the meantime. We can recognize that the shuttle slowly turns to the right, more complex than the still from "A Matter of Time" that was likely created using a photo. 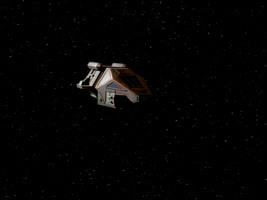 J'naii shuttle miniature in TNG: "The Outcast"
The miniature remains unchanged compared to "Final Mission". The shuttle is strongly illuminated from the outside. This is an effect of the null space that both shuttles have entered. Although the hull color of the miniature is arguably still brown, the J'naii shuttle comes across as light gray due to the illumination. As there is no other indication of a color, we have decided that the "true" hull color of this variation of the shuttle is gray. 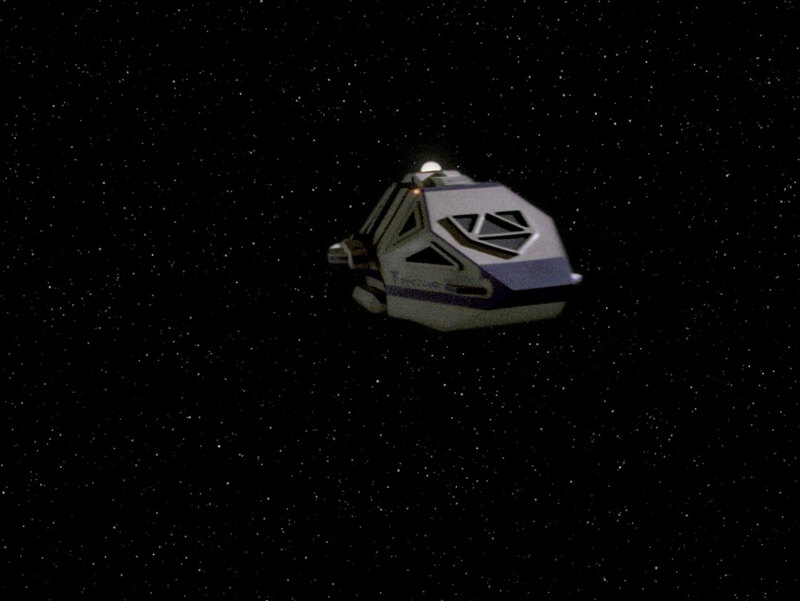 As the miniature itself still has no illumination, there is arguably no lateral "X" either on the shuttle. In "Birthright I" we can see the shuttle interior, just as well as the miniature. 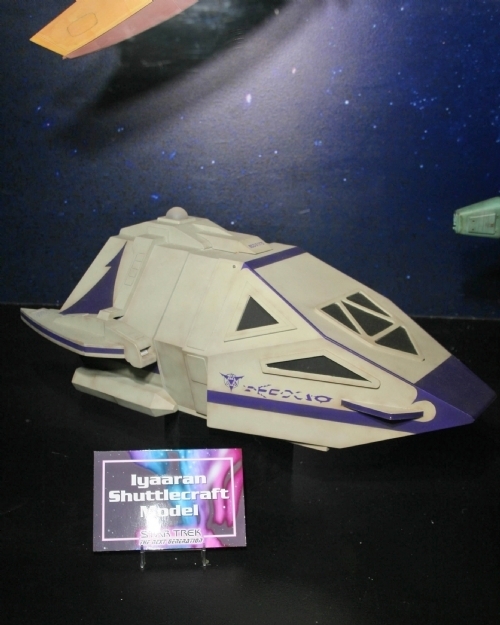 Here, it appears as Jaglom Shrek's Yridian shuttle. 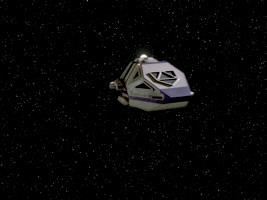 The script of the episode calls the Yridian shuttle a "redress of Enterprise shuttle". But this is clearly not the case, as the the Nenebek was used for the inside and the outside. Yridian shuttle miniature in TNG: "Birthright I"
The shuttle miniature looks just like the Nenebek. The brown color is still the same. Interestingly, there are two diffuse green areas, one in the panel with the thrusters underneath the side windows and one on the lower triangular hull portion with a circular structure. 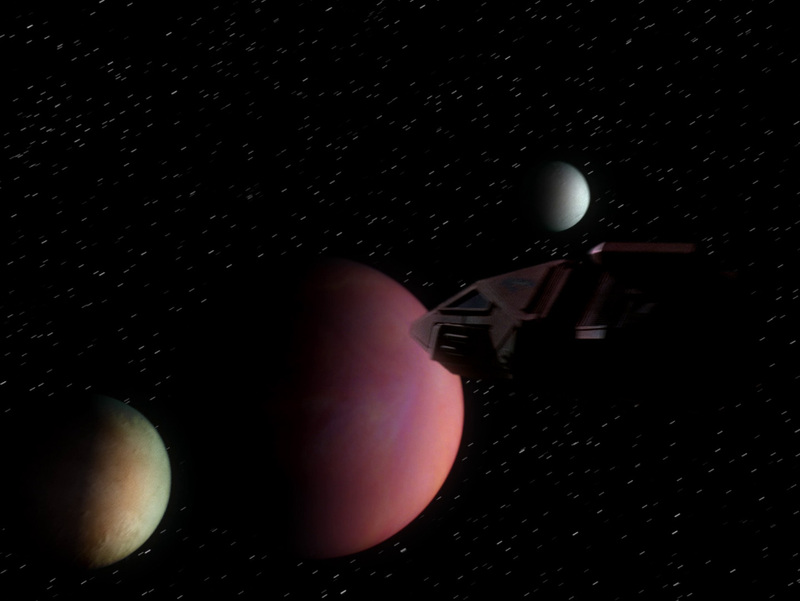 They are still present and even better visible in the HD version. These are no effects of a self-lighting of the model, as the model never had any lights, and also visible on the miniature. It is well possible that those green spots were already on the small model in "Final Mission". The "X" in the aft area of the shuttle is not illuminated, like already on the Nenebek. 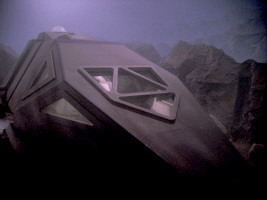 The cockpit windows are like on the Nenebek too. We can't see the big window in the interior shots of the shuttle though. Through the foliage, we catch a glimmer of his shuttle's hull. It is interesting to note that only the new, aft part of the shuttle mock-up is visible. This part appears for the first time since "Final Mission" and is still almost the same. The "X" is no illuminated orange red and still blinks. The colors are like on the Nenebek: mostly brown, with some gray areas. 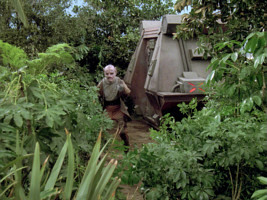 Yridian shuttle mock-up in TNG: "Birthright II"
The forward part of the shuttle is not recognizable because it is obscured by the leaves. We know how heavily this part of the mock-up was changed for the time pod in "A Matter of Time", so restoring it to its original appearance would have required quite some effort. Indeed, we can see some silvery reflections from behind the leaves. So we assume that the "time pod" was connected with the aft compartment again. This was required because the first part of the episode called for the combined interior set of both parts. 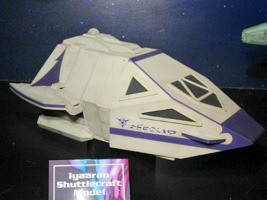 For this episode, in which an Iyaaran shuttle is supposed to appear, the full-scale mock-up was heavily redressed. The changes in the interior, on the other hand, are rather moderate. 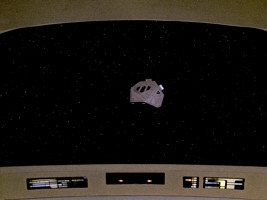 In addition, an all-new miniature was built, as the episode required a number of shots of the shuttle in space. This would not have been possible with the life-size model, the way it was done for "A Matter of Time", and will be done for "Gambit II". 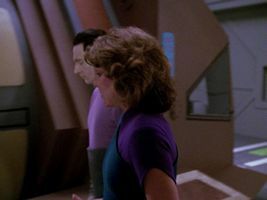 Iyaaran shuttle miniature in TNG: "Liaisons"
As we know by now, the new miniature is not a redress of the small Nenebek model, as this still exists in its original form. Instead of a redress, a completely new miniature was built. This new model was always meant to appear on screen and includes internal lighting. On the top of the model we can see a lighted dome. Also, it features position lights. The engines that are located underneath the wings are illuminated too at the aft end. The life-size model was modified in the same fashion as the new small one. It now has big wings/engines. The shape of the rear wall of the aft cabin is still the same, however. Its hinge is on the port side now. Iyaaran shuttle mock-up in TNG: "Liaisons"
The two hexagonal thrusters on the top of the aft section were removed and placed underneath the new wings of the shuttle. The engines shine yellow when activated. For the first time we can clearly see the new triangular windows, on the life-size model as well as on the miniature. The front window is no longer quadrangular but pentagonal, with the tip pointing downward. 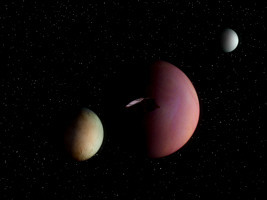 It consists of four smaller triangular segments. The front tip of the shuttle is a sharper one, compared to the one on the Nenebek. 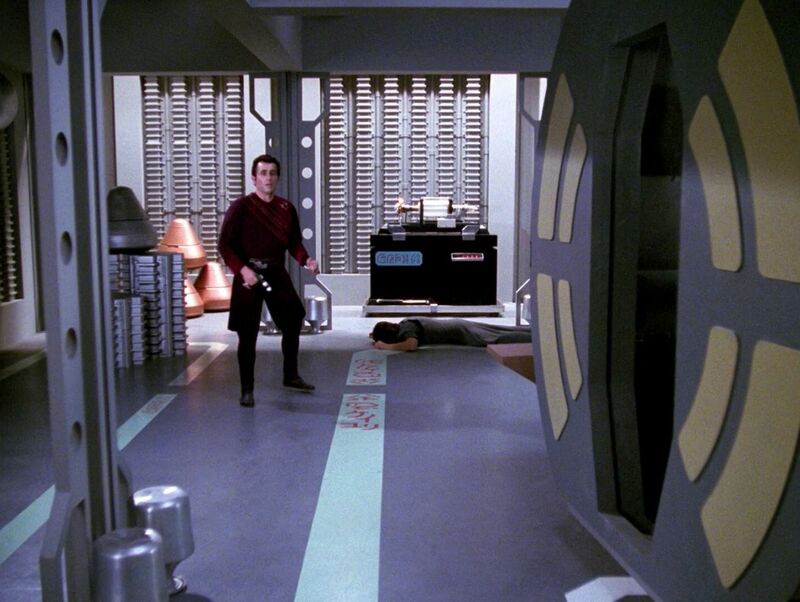 The front of the time pod in "A Matter of Time" was also a sharper angle, but with a rounded tip. There are two small wings with purple edges, which we can only see well on the miniature. The whole hull of the shuttle is decorated with purple lines and patterns, as well as with the Iyaaran symbol and writing. 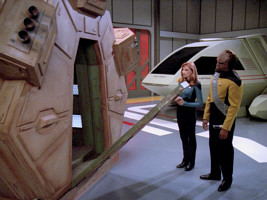 The outside of the life-size shuttle appears for the last time in "Gambit II", as the Klingon Toron class. Like already in "A Matter of Time", a shot of this life-size model was also used for the brief appearance of the shuttle on the Enterprise-D viewscreen. In HD, it looks like the windows were darkened in post production. As far as we can tell, no miniature of the Toron class exists. 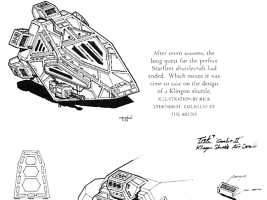 For the reuse of the shuttle in this episode, Rick Sternbach created detailed drawings. 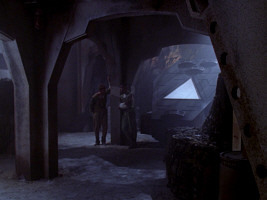 Klingon Toron-class on screen in TNG: "Gambit II"
In the head-on view as visible on the main viewscreen we can see the front window of the shuttle, which is still pentagonal. It is separated into three segments, by two vertical struts. 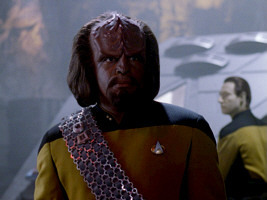 As we can see in the scenes shot in the shuttlebay set, the Klingon shuttle doesn't use the extra aft section. The hexagonal cross-section of the aft part is the familiar one. The shuttle has three new boxes with thrusters on the three upper edges of the hexagon. The frame of the aft door is still heptagonal. There is a door in the frame again, of course, as it now leads outside. 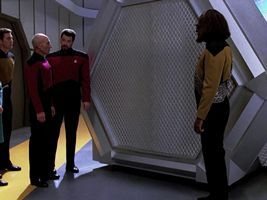 The door itself is hexagonal, and flat on the bottom with an edge parallel to the floor. 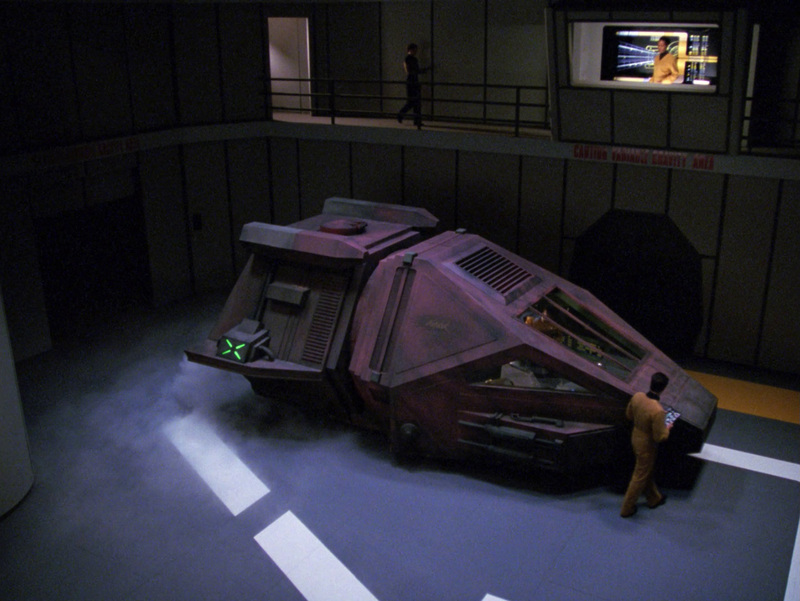 Klingon Toron-class mock-up in TNG: "Gambit II"
Below the lateral window there is still a box with thrusters, but a smaller one than on the Nenebek. The sketch by Rick Sternbach shows a weapon in this place, which is not the case on the actual mock-up. The triangular upper lateral windows are covered with some grid, just as the lower lateral windows. The whole shuttle is painted light brown and features various Klingon scripture and symbols. We can also see this on the front, which is only visible on the viewscreen. The following table summarizes all appearances of the Nenebek mock-up and prop (this article), as well as those of the corresponding interior set. 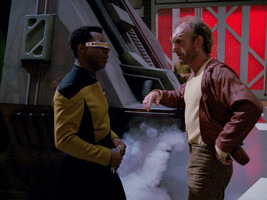 TNG: "A Matter of Time"
Many thanks to Rick Sternbach, Mike Okuda and Larry Nemecek!